Extracorporeal Shock Wave Therapy (ESWT) treats a variety of conditions using shock waves outside the body. This quick, effective procedure harnesses intense but very short energy waves to heal many chronic painful orthopaedic or sports-related conditions. 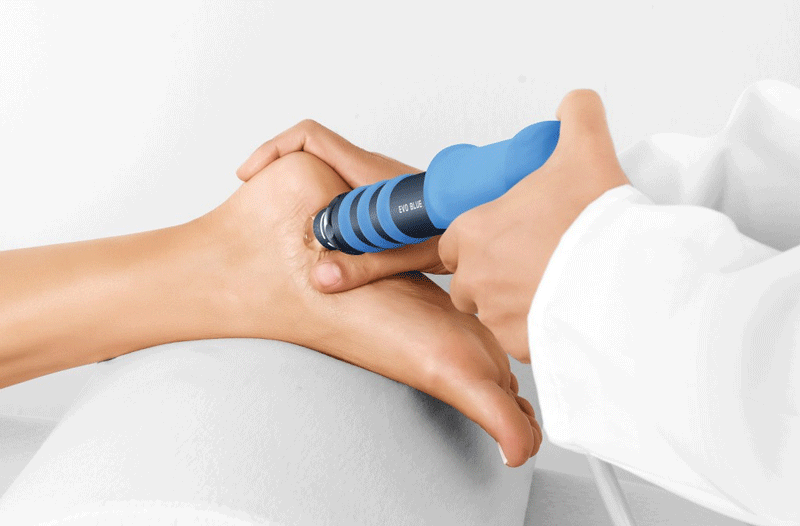 Extracorporeal Shockwave Therapy treatment is a clinically proven treatment available for patients presenting primarily with chronic tendon disorders. This is a successful second line treatment for patients who fail to respond to appropriate conservative management including traditional physiotherapy. It works by delivering impulses of energy, targeted to specific damaged tissues within the abnormal tendon. The shockwaves are mechanical, not electric, and work by increasing blood flow to the injured area. This accelerates the body’s healing process. The ESWT application lasts about 5 minutes to deliver the shockwave energy and you must attend for 3 sessions over 3 consecutive weeks. Originally this treatment was only available through an orthopaedic consultant and was extraordinarily expensive. Now it is performed by many physiotherapists around the country who wish to be able to help their patients directly. ESWT is now available at Glencairn House, delivered by Carolyn Humphrey Physiotherapist, for self-paying and insured patients.